I have two new polishes from Sassy Lacquer's spring collection to show you today! The Spring Showers Bring May Flowers Collection is made up of soft, delicate shimmers. The two I have for you today are Emerald Meadow and A Frosty Crocus. 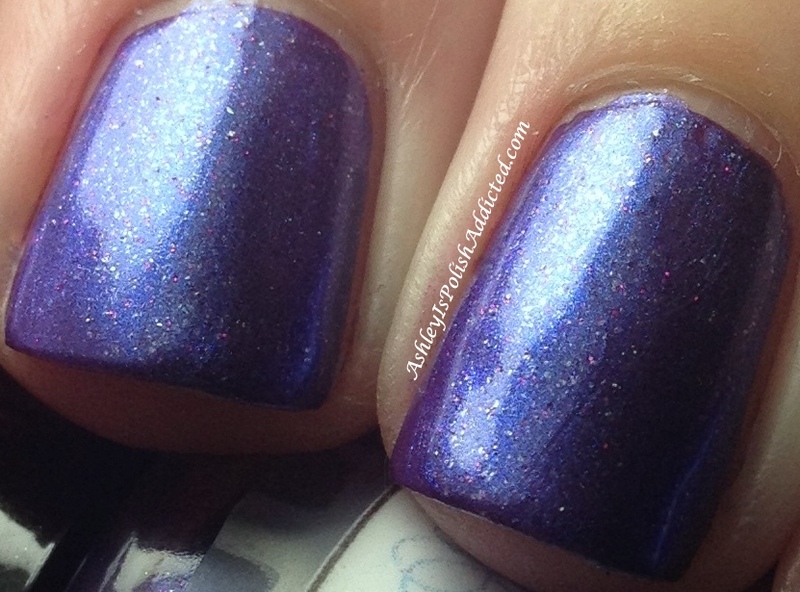 Carrie from Sassy Lacquer gives the following description for her new collection. “Spring Showers Bring May Flowers”. The grass green of spring for Emerald Meadow, the dancing in the wind daffodils for the yellow one, the first flower of spring that pops through the snow-the crocus, the blue mist of the rain, the morning’s first dew, Tiger Lily’s – My Fav flower ever-had them in my wedding bouquet. 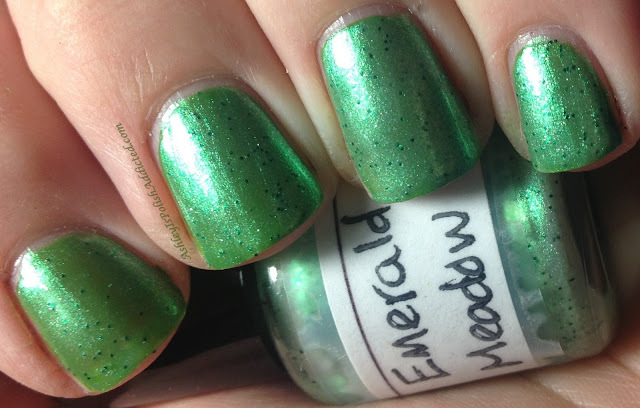 Emerald Meadow is described by Carrie as "A bright pastel green shimmer with green glitter. 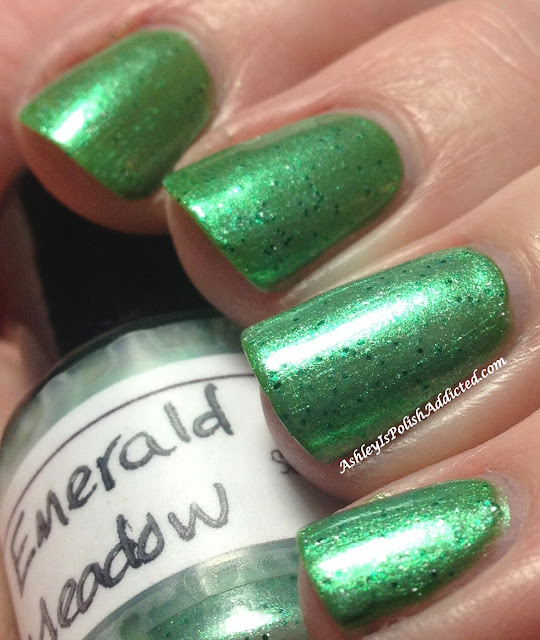 Looks great over dark colors, it brings out the green base. Bottled after dreaming of grassy meadows swaying in the wind." I tried this one on its own but it was very sheer and I personally wouldn't be willing to do as many coats (my guess would be 5-ish) as it would take to make it opaque so I used it as a topper. 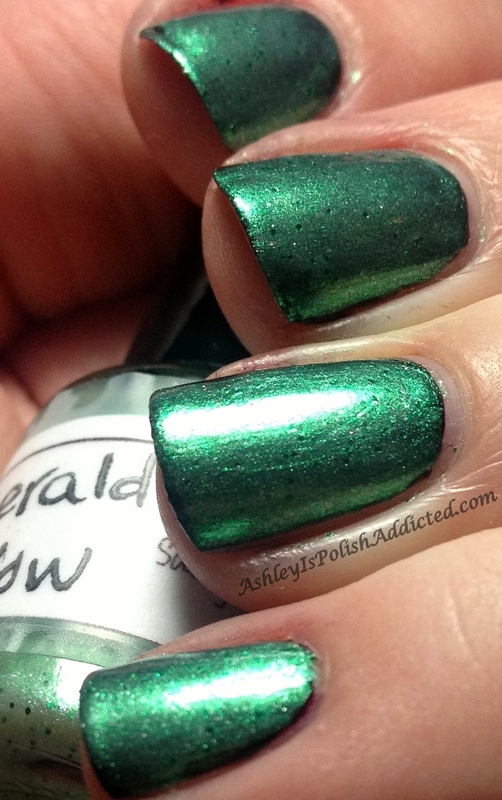 I used one coat of Emerald Meadow over Sinful Colors Exotic Green (a grass green creme). I also have a bonus pic of it over black. I topped it off with one coat of Poshe. I had no application issues at all. A Frosty Crocus is described by Carrie as "A stunning purple with flashes of pink and many different colors. Simply beautiful. Named after the first flower of spring." 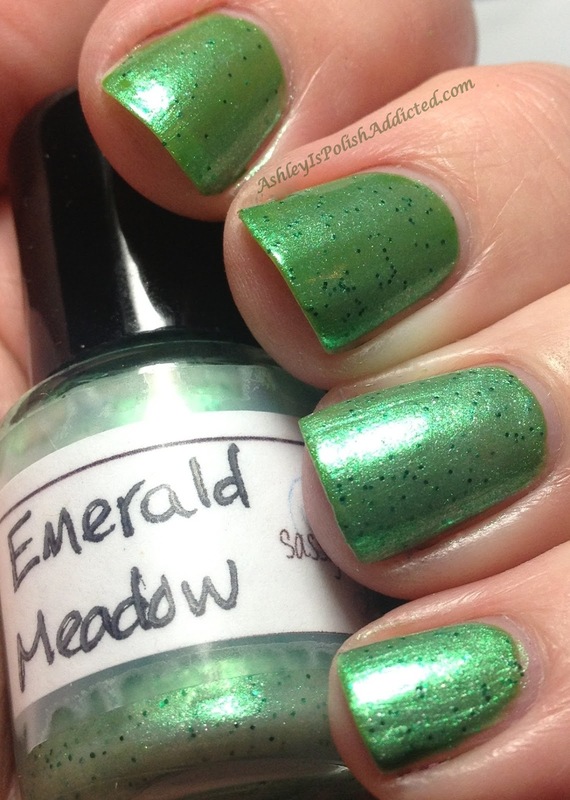 This one was more opaque than Emerald Meadow but still pretty sheer so I used it as a topper as well. 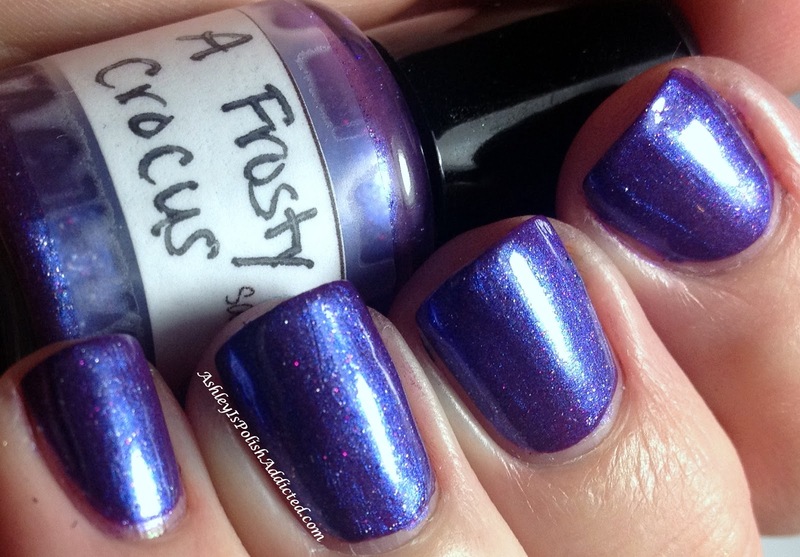 I used one coat of A Frosty Crocus over a medium purple creme (Nails Inc. Westminster) and also topped it with one coat of Poshe. 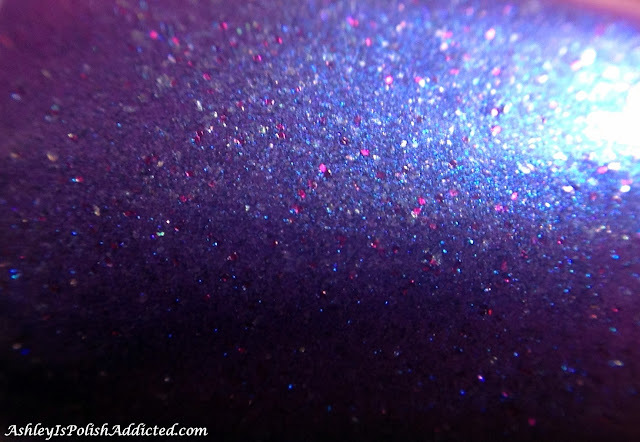 I love the shimmer and depth in this one! What do you think of these? I think they are perfect for spring! These are both available now! Make sure to visit (and follow!) at all of the links below!